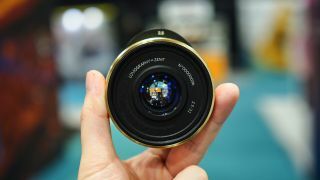 Its Kickstarter campaign still has five days to go, but the Lomography Lomogon 2.5/32 Art lens made its public debut at The Photography Show – and the little brass beauty turned plenty of heads in Birmingham. The Lomogon has a 32mm focal length with a maximum aperture of f/2.5. What's so special about that? Well, the aperture is controlled by a circular aperture disc that – the aperture doesn't have irising blades, but rather five fixed aperture settings: f/2.5, f/4, f/5.6 and f/11. Because these are 'holepunched' onto the disc, rather than relying on aperture blades, this means that the apertures are perfectly circular – which translates to flawless "bokeh balls" rendered in the background blur. The act of simply turning the aperture disc is an absolute joy, as is the tantalizingly tactile focus ring. The Lomogon is exquisitely constructed and using it rekindles the tangible joy of photography, making the experience of manually focusing and working with set apertures a true pleasure. In addition to the lens currently at The Photography Show, a handful of Lomo Amigos (essentially Lomography ambassadors, handpicked from the community) have been testing the Lomogon, with the feedback being that "this is the best lens Lomography has ever made". So far the Kickstarter campaign has already quadrupled its $100,000 goal, and with five days remaining it could potentially hit half a million dollars. The Lomogon is available in Canon EF, Nikon F and Pentax K mounts, with prices starting at $350 for the Black Aluminum version of the lens and $420 for the classic-looking Brass. Head over to Lomography UK's stand, B13, at The Photography Show to check out the lens for yourself.